If you’ve been following Proofread Anywhere for a while, you might think this site is only around to teach people how to become proofreaders. Well, I’m here to tell you that’s not why we’re here. I do what I do every day so I can help you be successful — whatever that looks like for you. Here’s the thing about success: It takes effort, and there’s a cycle. It’s not just, “I’m gonna go be successful.” Most people think motivation will get them from here to there, but let’s get one thing straight: You’ll have to do a lot more than motivate yourself to succeed. I’ve seen it time and time again. People come up with these crazy detailed plans for how they’re gonna “be successful,” and then year after year they stay right where they are, never moving forward. So my intent with this post is to bust the myth of motivation and show you how you can really “hack” success. Everybody thinks success starts with motivation. Especially around New Year’s time, everyone’s making their highly “motivated” resolutions — resolutions they’ll finally keep this time — because THIS time will be different. Have you been there? This girl has… many times. I beam with pride that I’ve finally figured out a plan; I see the results I want in my mind’s eye, and I’ve made up my mind I’m finally going to do what it takes to make it happen. Finally. But then… I don’t make it happen. And I think I’ve figured out why. 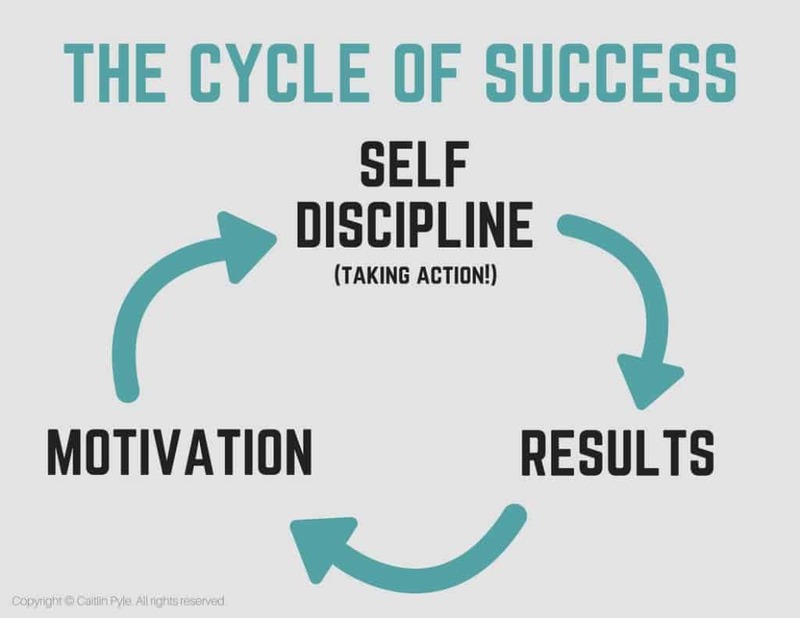 It’s because success doesn’t start with motivation… it starts with self-discipline. Self-discipline may seem like this obscure thing that nobody can really define, let alone achieve. I’ve felt that way. But self-discipline is simply taking action toward your goal, whatever that is, no matter what you think is standing in your way. It really has nothing to do with motivation — at least not at first. 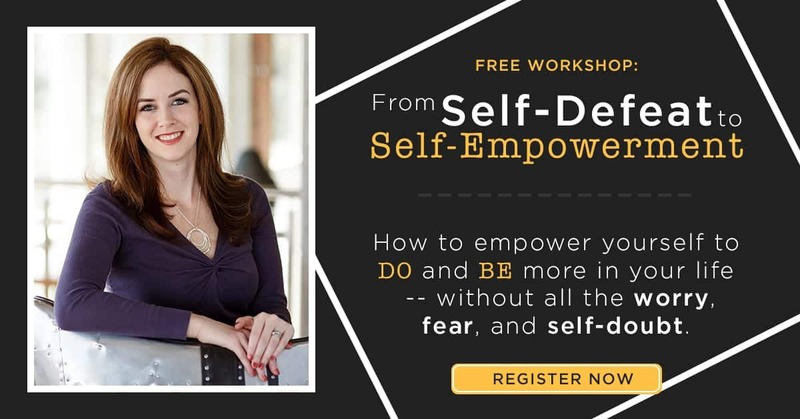 You might be thinking, “Duh, Caitlin, of course you have to take action… but I gotta be motivated to take action first.” Well, actually, no, you don’t! While it’s true most people believe that you have to motivate yourself to be successful, that’s just not true. You might have a little bit of motivation or “gusto” to work with, but if you rely only on that motivation to drive your success, you’re setting yourself up for disappointment… because motivation is merely a feeling, and feelings are fleeting. Motivation is a flighty phenomenon. It’s here one minute and gone the next. It never sticks around for the long haul. Believe me, I know this. You cannot trust motivation to help you achieve success. You can’t trust motivation, but you CAN trust self-discipline. You can trust your own consistent actions. Self-discipline is that thing that makes you show up every day — even when you don’t feel like it. This part is key. It’s a commitment. It’s a decision. It doesn’t factor in feelings (like motivation) at all. This morning, for example, I woke up in a bad mood, and I didn’t want to get up and work out. I had not even a shred of motivation. But because I’d committed to getting in 30 minutes a day — and because I knew consistent action would get me results — I got up and did the workout. That’s what successful people do, you guys. Successful people show up every single day, and they take action — even if they have no motivation at all. It all starts with showing up. It’s not a one-time thing, though. You have to do “the thing” to get results. And you gotta do it at least most of the time if every single day isn’t feasible. If you start out doing your thing (losing weight, finishing the course, learning X, building Y, etc.) with the mindset you’re going to be done eventually, you will not succeed. Sitting and waiting for everything to fall into place and make you a superstar ain’t gonna work either. It’s a continued commitment to taking action that never stops. Maybe you’re a transcript proofreading student right now, and you just finished Module 1. A common thing I see is people take action for a while and then just stop for some reason. What happens then? Well, nothing happens. Maybe that’s your story. You stopped the course for a while and you got all down on yourself because yet another thing “didn’t pan out” the way you wanted it to. But what actually happened is you stopped, right? You stopped taking action. Now imagine — if you continue taking action — what will happen. You’ll finish the course! You’ll study, you’ll learn a lot. And then what happens is you will see results. This is the next part of the cycle. If you depend on motivation to get results, you’ll be disappointed. Results are the delicious fruit of you taking action. And sometimes fruit grows slowly. Do you know how long it takes a pineapple to grow? Two years. That is one delicious fruit. Don’t give up on nurturing your pineapple just because it takes a while. Let me give you another example that has nothing to do with pineapple. Late last year, I lost about 11 pounds of the approximately 20 lbs I’d put on since 2014. I’ve tried to lose weight a lot in the past, and I’m always super motivated in the beginning. But then — so predictably! — I get lazy. I let feelings take over, and I say things like, “Oh, this is so hard,” or “I don’t want to do it if I don’t feel like it!” And so I decide I’m just not gonna do it anymore. So guess what happens then? I don’t get results, I’m disappointed, and I have zero motivation. So I don’t take any more action. It’s not the plan that didn’t work. I DIDN’T WORK. Now that I’ve figured out how I was constantly sabotaging myself — and now that I’ve stopped starting over and each time thinking I’ll be able to quit at some point in the future!! — I’m finally getting results. Sometimes my inaction is perpetuated by my own fear of failure. The thing is, the fear isn’t real, and the failure hasn’t happened. Failure will only happen if I give up. What people who struggle with success don’t realize is that we shouldn’t fear failure; we should fear inaction. Failure is something that could happen but hasn’t yet, while inaction is something that’s actually happening right now — and it’s preventing me from getting what I want. 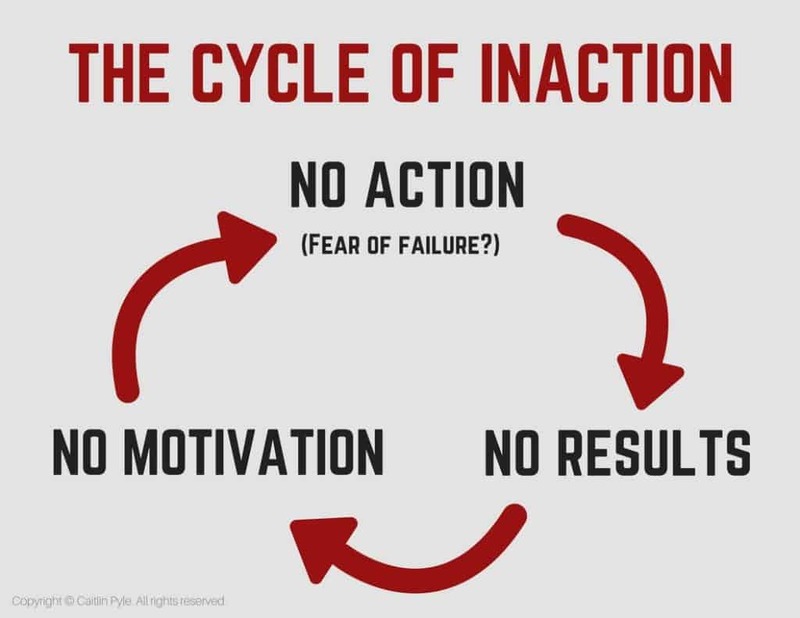 Inaction is the #1 enemy of success. So when I’m afraid of failure, I don’t do anything… so I don’t see results… which means I’m not motivated to do anything. So I don’t see results… no motivation… no action. See the cycle starting to form here? When I don’t take action, I don’t get results. Because I don’t get results, I have no motivation to do that thing I need to do, so I don’t take action and… I continue to get zero results. Once I realized that the thing that gets results is showing up even when I didn’t feel like it, something clicked for me. I decided I was going to get up every day and do a 30-minute workout — you guessed it! — even if I didn’t feel like it. I committed to making better choices (not perfect!) every damn day. Didn’t matter how I felt, I was going to do it. So that’s exactly what I did. Being completely honest with you here, but 90% of the time, I didn’t feel like it. Especially at first. But I kept at it… and guess what happened? I started to see results. Those results are what got me motivated to keep at it. See where I’m going with this? Results are not a byproduct of motivation; motivation is a byproduct of results. And results? Results are a byproduct of self-discipline. Here’s a second graphic to illustrate this. I call it The Cycle of Success. When you understand The Cycle of Success, you realize just how much power you have. Yes, YOU! You have power. Want to start a business? You’ve got some stuff to do. There’s a lot to learn. You have to show up. You have to launch. Want to lose weight? Make the hard decisions to do the hard stuff. For me, that was to admit I was eating too much and making tons of excuses about why I wasn’t working out daily. I had to look my laziness in the face when it showed up — 90% of the time! — and show up anyway. The key to consistent results is consistent action. Consistent results yield consistent motivation. … and you will get results. Leave a comment below and share at least one thing you’re going to take action on — not just today, but EVERY DAY — even when you don’t feel like it.